This movie “The Impossible” has got to be the best and most astonishingly powerful movie that I have watched in the last few years. Normally, when I watch a movie, I do not allow myself to get sucked emotionally into it, preferring as I do to critique its story for plausibility as well as examine it for its technical execution. I could not do that with The Impossible, which just simply drew me in as though I was part of it rather than a critical spectator. The emotions that the movie elicited were so powerful that there were times while watching when I could feel my eyes begin to mist. I cannot recall the last time a movie did this to me. The Impossible is the true story of the Japan-based British couple Henry and Maria Bennett – played by Ewan McGregor and Naomi Watts, respectively – who flew for a Christmas holiday to Phuket Island in Thailand with their boys Lucas, Thomas and Simon in 2004. If anything, the story of the Bennetts, it is pointed out by the carnage even as the Bennetts escape to a private jet, is the exception to the rule – an anomaly at a time when distress is the prevailing emotion. What was supposed to be a treat for the entire family turned into a nightmare when the island was hit by the tsunamis spawned by the powerful earthquake just off the coast of Banda Aceh in Indonesia at the time. 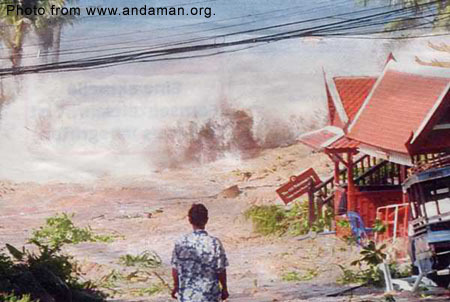 The members of the family were enjoying themselves poolside at the Orchid Resort when the first tsunami struck. They became separated. Maria and Lucas were swept away farther inland while Henry was relieved to see his younger boys Thomas and Simon clinging to trees as the worst of the tsunami passed. This movie is not just about telling a true story. More importantly, it is all about authenticity: from the towering wall of water that rose from off the sea and rolled into land; to the unthinkable amount of debris that it accumulated and swept along with it; to the utter destruction that it left in its wake. The authenticity is not only stunning; it is also appropriate and respectful to those who were there and lived through the nightmare. I had CNN on back in 2004 when word of the Banda Aceh quake first broke. I stayed glued to the station as one horror story after another began to unfold. How The Impossible managed to replicate the ghastly scenes – and even the arrival of the tsunami is unbelievably authentic – I cannot even begin to imagine how. The Spanish director Juan Antonio Bayona does not give viewers the chance to watch safely from a distance. Instead, he lets them swim in the murky waters with Maria as she swims for her life; makes them feel her pain as she is hit by a sharp piece of wood underwater; and forces them to struggle with her as she tries to reach and finally hold on to her son Lucas. Then there is the sort of kindness that total strangers the world over are capable of extending to fellow human beings whatever the race in times of tragedy. A group of villagers who cleans Maria up and then transports her to a hospital; a stranger who lends Henry a cell phone so he can call relatives in the UK; and a Thai nurse who helps Lucas find his mother after she is moved from the hospital bed where he leaves her. Human compassion is instantaneous when tragedy strikes; and The Impossible highlights this as much as it does human despair. The chaos in the hospital is again as it was shown by CNN in 2004. More patients than the hospital could accommodate; bloodied and dying victims; people desperately looking for loved ones from whom they are cruelly separated by a stroke of Nature. Painful as each search is, particularly when the end result of the search is the confirmation of the death of a loved one, there is nonetheless poignant and cathartic ecstasy when family members are reunited with each other after the seeming hopelessness of the situation. The overflow of emotions in The Impossible is, at times, simply overwhelming. The viewers are not allowed to escape. They are taken back in a time machine to 2004 to feel exactly as those who were there felt. I ponder the significance of the title The Impossible and am at a loss ascertaining to what it pertains. It can be that the story of the Bennetts was something seemingly impossible – given the scale of the tragedy – that somehow by a stroke of sheer luck and coincidence became possible. Or, it can be the impossibility of human resistance when Mother Nature flexes her muscles to show humanity who really is in charge. In the end, the title probably does not even matter. While the story of the Bennetts is as happy as an ending to a story can get given the circumstances, the viewers are never for one moment allowed to think that this is a happy story. I watched the movie online, by the way. I checked with IMDB and a Philippines showing is not listed. If you have a means to watch the movie online or can get your hands on a DVD copy, then make sure you watch it. Even if you did not follow the Banda Aceh quake in 2004, The Impossible will not only tell you what it was all about but actually make you live through it. Movies like this only come once in a while. Do not allow the chance to see it pass you by.